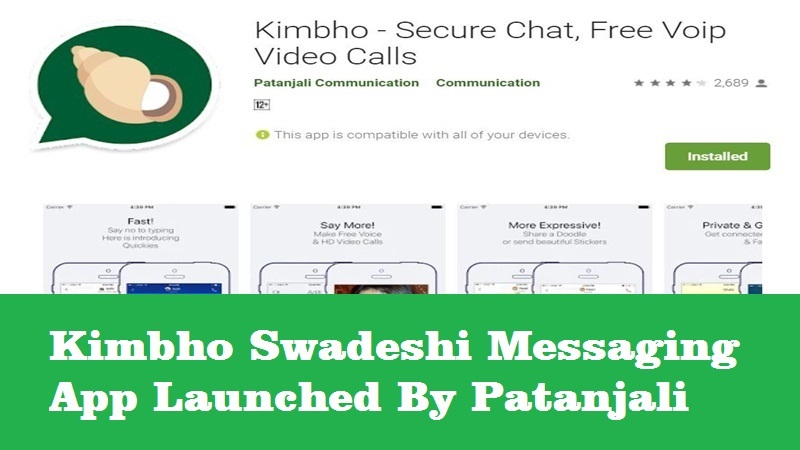 As all you may know that Patanjali has released a Messaging application called Kimbho on Wednesday 29 May 2018 to compete with Whatsapp. The Baba Ramdev's Patanjali Communication launched this app collaborating with BSNL (Bharat Sanchar Nigam Limited). The Kimbho app has been launched and it hits more than 1 Million downloads from Google Play in a day, a spokesperson from Patanjali, SK Tijarawala tweeted, “Now Bharat will speak. After launching Patanjali-BSNL SIM cards. The Yoga Guru launched this Made In India Messaging app (Ab Bharat Bolega) which is full of Swadeshi Messaging Application and it's avalable both for iPhone iOS and Android APK, the app can be download from Apple Store for iOS users and Android user can directly download from Google Play. But here is a twist, the Swadeshi messaging app Kimbho has been removed from Play Store after one day of it's launched, due to some security issues. French security researcher who is known as Elliot Anderson on Twitter has called it a “security disaster”. He said that the Kimbho app had several security bugs and he could access all messages of all the users. As this app has been removed from Google Play, but still if you search Kimbho app on Google Play store, you will find there are so many apps called "Kimbho" and these apps are not official Patanjali Kimbho application available on Google Play. Due to security reason the app has been disappeared from Google play, but it may relaunch official after develop and fix the bugs. Before you going to install such other non-official apps please verify it then move forward, otherwise you may face security issues on your Android device. As I said before the French security researcher Elliot Anderson on Twitter said "this app is a security disaster, I can access the messages of all the users" and again he twitted The Kimbho App is a copy paste of another application. The description and the screenshots in the app stores are the same. Moreover, the Kimbho app is making request to bolo messenger. So finally we know that the Kimbho app has some security issues and let the developer to fix the security bugs and it may re-launch soon, please do not worry, if you have already installed the app please remove it as the app is not working now and have patience until the Official Kimbho app release. One more thing I want to say please do not use any unsecured messaging apps, which leak your personal messages or your message can steal by hackers, have safer and secure Android apps always, Thank your and visit again to get more updates.